Time for Ghana... the United States' first elimination-round opponent of this 2010 World Cup. After barely finishing behind Germany in their group Ghana should be a tough test for the USA... if I remember right they beat us in the 2006 World Cup to formally eliminate us from the group stage. So... it's payback time. And no more draws either. This time, someone has to win. As for the beer in Ghana, this would be pretty easy to repeat the Nigeria post, as Guinness is one of the favorites, and just like Nigeria there is a Guinness brewery in Ghana as well, producing Guinness products as well as the hugely popular Star beer. But that would be lame, right? And fortunately I stumbled across something a little more interesting... pito. Pito is essentially rural Ghanaian homebrew, but also sold on a small-scale level out of people's houses. It's made from either fermented millet, which is a cereal-like grain, or sorghum, a type of grass more popularly used in Chinese liquors. 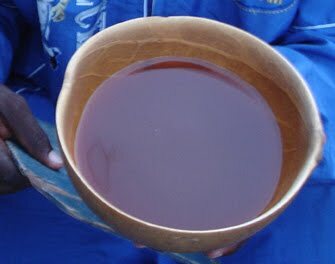 Apparently a common side profession in Ghana is to brew this home-made beer and then sell it straight out of calabash gourds. It's commonly served warm (which we would obviously frown upon here) but then, if you have no electricity, how are you going to keep it cold? From what I've read, pito is a sour, usually high alcohol beer... something I'd absolutely be willing to try. The Bite And Booze post on Ghana.